When it comes to backyard enjoyment, you’ll have to search long and hard to find anything that offers more summertime fun than an inground swimming pool! More and more people have turned to Royal Swimming Pools for our easy to order, one-stop shop, Swimming Pool Kits! Our kits give you the opportunity to be more hands-on in every step of the building process with the flexibility of choosing what you do and do not want to tackle on your own; you can hire a contractor, or you can roll up your sleeves for a true DIY project! DIY POOL KITS HAVE BECOME INCREASINGLY POPULAR FOR TWO MAIN REASONS! 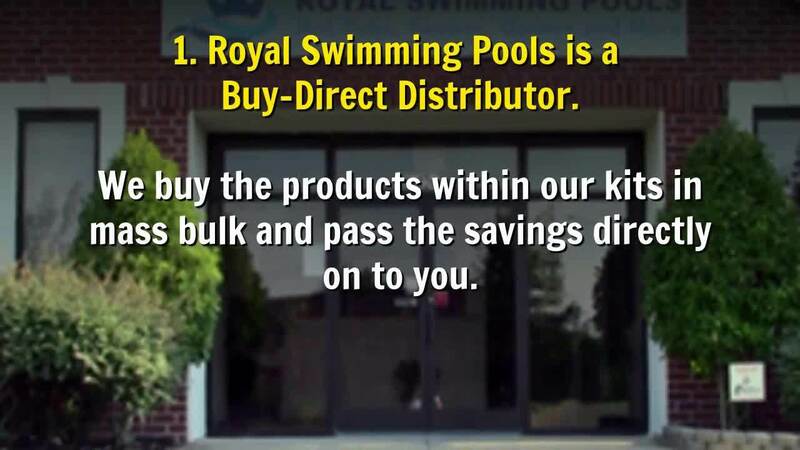 Royal Swimming Pools is a Buy-Direct Distributor. We buy the products within our kits in mass bulk and pass the savings directly on to you! By cutting out multiple middlemen found not only in traditional retail stores, but also in countless contracting services, you get the most cost-effective options when choosing your new pool! All of the main items that you need to build your pool comes included in your kit! You never have to guess if your missing a vital piece or item. Plus, if there’s anything extra that you’ve been dreaming of to make your pool beyond perfect, (Sun ledges, LED Light Shows, Water Fall Diving Boards, etc.) you can add onto your kit or even fully customize your kit! The only items you’ll have to provide will be your construction materials such as sand, concrete, PVC pipe, etc. all of which can be purchased at your local hardware store or some can be purchased through Royal Swimming Pools, such as our very popular plumping kit! See what's included in a pool kit here! BONUS: There’s something to be said for bragging rights and the sense of satisfaction being involved in building your own swimming pool! Every one of our pool kit comes with a step by step manual, including information regarding dig specifications. Our manual is specifically designed for the homeowner to become the contractor or overseer of the building project and includes toll-free technical support to help you during the construction of your swimming pool! While most of the installation can be completed on your own, there are steps in the process that are more-often-than-not completed by a subcontractor. In order to ensure that you are still getting the best savings, it’s important to know that most pool companies do not build the pools that they sell but hire the subcontractors themselves and add the largely marked up prices to your final payment due. By hiring your own subcontractors directly, you cancel out those high hidden fees! The easiest way that we’ve found is to search Google to find qualified subcontractors that will do the same work at a typically much lower cost! Most homeowners complete the following steps on their own for the greatest savings, however, you can choose to subcontract these to a pool installer or a local handyman as well! Take a look at our construction guide for an overview of each of these DIY steps. 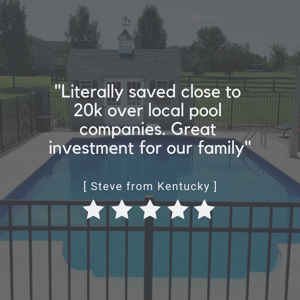 Based off our customers feedback, even those who purchase a Swimming Pool Kit and hire a subcontractor for the majority if not all of the project, typically see savings of $6,000+ when compared to the quotes and estimates provided by traditional swimming pool companies. The less work that you subcontract out and the more you do yourself, the more you will save! True DIY customers have reported saving of over $10,000 by building their own pool! There you have it! When comparing the savings of working directly with a distributor combined with the savings of eliminating a contractor for most or even all of the building process, you and your family will be enjoying countless hours in your new pool at a fraction of the cost traditionally associated with the luxury of having your own private backyard oasis! Click our What to Know When Buying a Pool button for additional resources and commonly asked questions or go directly into Designing your Pool today! For additional resources on this and other topics we've included links to additional articles and resources for you! EVERYTHING you've every wanted to know about buying an inground pool! How much does it cost to install an inground pool? Concrete vs. Fiberglass vs. Vinyl Swimming Pools: what’s the pro, cons, and difference? Hopefully, we've helped answer some questions for you or, even better, given you even more to think about. We have amazing resources to find answers to your most thought-provoking pool questions! However, we'd like to cover a specific question now: Why? Why buy from us? What value do you as a consumer get from purchasing your oasis from us over another company? The image below covers so many benefits of shopping with Royal Swimming Pools however we want to point out three of these that are really connected together and what WE as consumers take seriously when WE shop online. What we're talking about isn't our incredible track record of 30 years in the industry. It isn't our ability to create customized items in a way that is simple and easy to understand. It's not even our long list of ways to buy including multiple easy financing options? It's more important that all of that. Because it's about you. The three most important items that you can focus on below is how we treat... you. Our team builds real relationships with our customers. If you call in and speak to a sales consultant, that consultant provides support to you before your sale, during your design, can assist with your purchase, ensure that all your pool components fit properly together in a way that will give you the best experience once you're happily swimming. But it doesn't end there. We provide that same one-on-one support during your build and installation, if you have any technical, troubleshooting, or even warranty inquiries later down the line, we'll have you covered! This leads to our high customer satisfaction rating. Yeah, no for real- almost 5,000 reviews here with a rating of 4.8! Want more? See what reviews folks have said about us on Google! If you're pressed for time you can check out some customer feedback below. We've come full circle. We pride ourselves on taking care of our customers before, during, and after they choose to shop with us. This has led to our high customer satisfaction rating which has been made obvious by the positive feedback we see across multiple platforms. 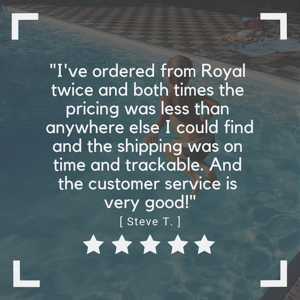 Why buy from Royal Swimming Pools? Because we'll treat you like royalty every day. What Is Covered Under a Pool Liner Warranty?